What Is Doggy Playcare? Learn About Our Saratoga Dog Daycare & Training Facility! About Doggy Playcare, Located on Maple Avenue in Saratoga Springs, NY! What is Doggy Playcare? Learn more about our indoor/outdoor daycare and training facility in which the dogs are cared for and supervised. With approximately 6000 square feet of fun space, Playcare dogs are allowed to play with other dogs and humans all day! 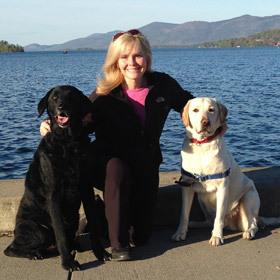 Jody Cracco is the owner of Doggy Playcare and Training Center in Saratoga Springs NY. She is a certified trainer with the IAGP (International Association Of Canine Professionals) and a CGC Evaluator (Canine Good Citizens). Jody has been involved with training and breeding Golden Retrievers for over 30 years. She has dedicated her life to teaching people that understanding their dog can be obtained naturally through communication, understanding and psychology, versus mechanics, fear and intimidation.